I saw this beautiful wedding video that brought tears to my eyes in general. But what got me the most, why I'm writing this post, is because I am so sad I will never experience what is in this video with my future (hoped-for) husband and Lily. 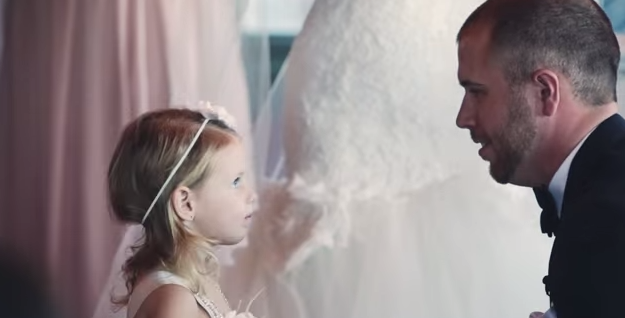 The bride in this video has an absolutely adorable little girl named Brielle from a previous marriage. Through tears, she says in her vows how she has prayed every night for a man to love her and her little girl and how God has more than answered her prayer. She says how her husband has shown her what true love is, from how he loves both her and her daughter. She thanks him for accepting Brielle into his life and loving her as his own. The groom's love and devotion to her as well as her daughter is evident and oh so precious. During his vows, he also makes vows to Brielle. He promises to do everything that fathers do for their daughters, to care for her, protect her, and love her forever. There isn't a dry eye in the room during their vows. I'm so sad that Lily won't be at my future wedding. One of the people I love most will not be there for any of the important life moments. It hurts that my husband will never even get to see Lily, except for in pictures, or hold her, except in his heart. It hurts wondering if he'll even be capable of loving her? It hurts that he never will love her as much as I do. I don't want to feel lonely in my love for her. I don't want to feel misunderstood when I'm grieving for my first-born while pregnant again or giving birth. He won't be able to fully understand how I'm feeling. Will he be supportive? I'm sad he won't be able to prove his love for Lily. I'm sad he won't be able to do all the things that fathers do for their little girls. I'm sad he won't be able to make vows to her too. I'm sad that the three of us won't be able to walk down the aisle together, as a new family. I hope he will still be able to accept Lily as his own, though only in his heart. I hope he will embrace the ways I choose to honor, love, and remember her. I expressed some feelings and thoughts I have about finding my future husband to a friend and she sent me an email that has really made a lasting impression on me. She wrote, "And just so you know, it is a great thing to be real and honest with yourself and the Lord about what your heart needs and desires in a relationship and NO! you are not being too picky! Just as the Lord knit Lily and Luke together in your womb, He knit YOU in your mother's womb. And, He KNOWS you, intimately. To take that to a deeper level of understanding, not only did He KNOW you before you were born, your parts and pieces were carefully chosen one by one according to the things you would need to accomplish the plan He had for your life. He actually knows you better than you know yourself! He ALREADY knows what you need in a man and He ALREADY CREATED HIM for you, and you for him.... he's out there somewhere. The Lord often brings him to mind for me to pray for him to come in to your life at just the right time... He WILL give you what you need in good times, on the hard days, and when there seems to be no other way. And just as He knit your heart to both Luke and Lily, so will He knit your heart to your husband!! ... Somewhere out there in this world is an amazing man with your name written on his heart even though he can't read the writing yet.... The Lord has a man made just for you whose ministry will line up with your ministry. And you can judge him by this: if he doesn't love and want to "adopt" Luke and Lily.... HE IS NOT THE ONE THE LORD HAS CHOSEN FOR YOU! :) You can take that to the bank dear friend!!!!!!!!! You will know him by his fruit." I cannot express how encouraging and life-giving these words are to me. God prompts just the right people, at just the right time, to encourage me. I know a lot of guys wouldn't "get" me, but I do believe if I am meant to be married, God has the right person picked out for me. And it only takes one. He is perfectly capable of preparing our hearts for one another and bringing us together in His perfect time and way. And even though he won't have the opportunity to father Lily on Earth, I believe God will knit our hearts together in a beautiful way and not only that, but He will somehow knit my husband's heart to Lily's and Luke's. He knits hearts together in a way only He can. Never settle, ladies. No matter what your life and your past looks like, God's plans for our lives are much more beautiful than our own. If you are a single mother, God has a man for you (if His plan for you is marriage) that will love your child as his own. He can knit hearts together. Wait for God's best. Don't take it into your own hands, but entrust this area of your life to the one who knows us better than we know ourselves. He knows what we need.